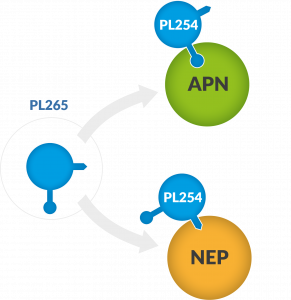 PL265 is a Dual ENKephalinase Inhibitor (DENKI), a small molecule with only one active metabolite (PL254) which acts by inhibiting the enkephalin-degrading enzymes APN (aminopeptidase N) and NEP (neprilysin), thereby increasing the local concentration of enkephalins triggering a local and sustainable pain relief. PL265 completed a phase Ia single ascending dose and demonstrated good safety. PL265 is currently being evaluated in a phase Ib multiple dose escalation and data from this study are expected in 2019. PL265 pharmacokinetics has shown that its target enzyme inhibition is effective and includes a half-life of 13 hours, making it an ideal oral candidate for the treatment of neuropathic chronic pain, and for local administration such as eye-drops for ophthalmic pain. Pharmaleads thinks PL265 has a significant potential as monotherapy or in addition to current treatments for neuropathic pain and intends to pursue a phase II trial evaluating PL265 in diabetic painful neuropathy which is expected to start in 2020. Neuropathic pain is a chronic pain condition where the underlying cause is due to nerve dysfunction. Approximately 7-8% of the population suffers from neuropathic pain. The current market for drugs to treat neuropathic pain is estimated to be worth $6 billion and is expected to grow, driven by increased life expectancy, incidence of diabetes and cancer, combined with better survival rates, often leaving many patients with severe neuropathies. PL265 is effectively enhancing the opioidergic system to relieve pain. In addition, the molecule targets a natural pathway meaning that you do not have the side effects seen when an exogenous compound, such as morphine, is administered. Prof. Solomon Tesfaye, Sheffield U.K.
Current treatments for neuropathic pain include antidepressants (tricyclic, duloxetine), anticonvulsants (gabapentin, pregabalin), and opioids that have dose-limiting adverse effects and/or very limited efficacy. With standard treatments (antiepileptic or antidepressant drugs), we only partially alleviate pain, by approximately 30 to 50% in less than half of the patients. However this is only achieved with the heavy price of significant side effects. The meta-analysis of studies looking at the treatment of neuropathic pain, published in the Lancet Neurology in February 2015, shows that 6 out of every 7 patients will not achieve a clinically significant improvement in their pain relief when treated with the two main drugs licensed for diabetic neuropathy. Ocular pain, such as dry eye, affects up to 20% of the population. Current treatments do not always relieve the patient’s pain as they may stil l suffer from chronic symptoms. There is a clear unmet medical need as there are currently no analgesics available for treating ocular pain, other than anesthetics which have well known shortcomings and can’t be used for more than 24 hours. Pharmaleads is currently completing the evaluation of PL265 for the treatment of ocular pain and dry eye syndrome in animal models. Pharmaleads conducted pharmacology studies with PL265 evaluating the product for the management of ocular pain and dry eye syndrome in collaboration with The Vision Institute in Paris, France. The study assessed the anti-nociceptive effect of PL265 in experimental models of ocular pain / dry-eye syndrome. These pharmacological studies evaluated both mechanical and chemical cornea sensitivities of experimental models in response to corneal injury and inflammatory pain after a five-day treatment with a drop of either PL265 (at a 10 mM concentration) or of phosphate-buffered saline (PBS) in the right eye, twice a day. The results of these studies provided the first evidence that PL265 is highly effective in decreasing ocular pain after various experimental corneal lesions. The study also revealed the novel anti-inflammatory properties of the drug. It also showed that the drug has no anaesthetic properties in the absence of corneal injury. The current global ocular pain and dry eye syndrome markets are estimated at $ 3 billion.